How do I set up a PTO policy? Once you're ready to set-up a new PTO policy, follow these steps. 2) Go to the Settings tab and click +Add Time Off Policy. 3) Select the checkbox for each of the holidays that your company observes. 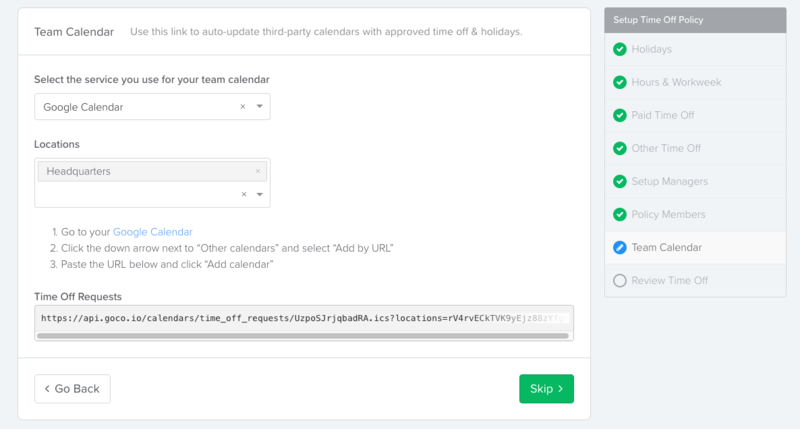 If your company observes a holiday that is not on the list, you can add a new one by clicking on the +Add a Holiday button at the bottom. 4) Specify how many hours/week the employees with this PTO policy work and which days of the week they work. This is important because GoCo calculates time off in hours, not days. If this PTO policy includes personal leave, sick leave, or vacation, switch the toggle for that option on. Click Edit for more advanced settings of each type of Paid Time Off*. *Please note: Accruals and advanced PTO settings are part of the Premium HR package only. By clicking Edit you will be asked to set-up the accrual rates and a few additional settings (tenure rules, maximum balances, carryover rules, etc.) for each type of PTO you have turned on. If you have Complete HR, you must keep the policy as Unlimited (like above). It will still track hours requested YTD for employees, but will not show an employee their balance or a remaining amount to request. 5) Next, you can customize other types of PTO that your employees can request. An example of this would be jury duty or work from home. In the second column you can indicate if you want this time off to count against their PTO or not. 6) Select the employees who will be approving the PTO requests of others by clicking the Add a Manager button. You will able to select a manager's name and the names of their direct reports. This is an important step because the manager gets notifications when their direct reports submit a PTO request. 7) On the next page you will select which of your employees are eligible for the time off policy that you are creating. Just click the checkbox next to the name of each employee that you would like to include. Employees can only be a member of one policy at a time, and checking their name off here may send them an email inviting them to start requesting time off (see below). 8) Next you have the option to sync approved time off and holidays to your company calendars. Select which third party service (Google Calendar, Outlook 365, etc.) your company uses for its team calendar and follow the instructions. Feel free to skip this page and come back to it later too. 9) Finally, you'll be able to review all of the settings for your time off policy. 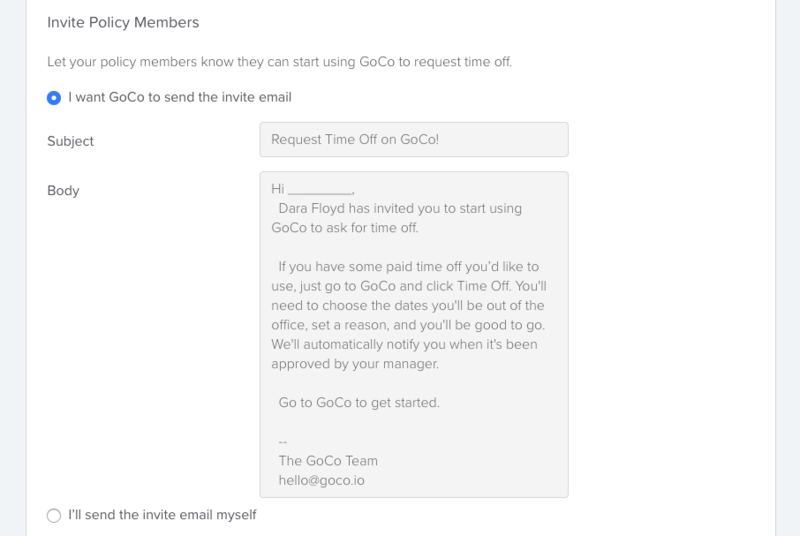 At the bottom of the review page you can select whether you would like GoCo to email all of your employees to let them know they can now request time off. If you would prefer to notify your employees yourself, just select the box that says "I'll send the invite myself." Then just click Finish and you're all done! If you have any other questions, please email help@goco.io!